Moss Building and Design honors veterans by making a donation to Wreaths Across America in honor of employee family members. This year, Northern Virginia remodeling company Moss Building and Design donated memorial wreaths to Arlington National Cemetery for their annual wreath laying. The donations for the wreaths were given in remembrance of employee family members and spouses who have served in the military. The initiative, which was spearheaded by Community Relations Manager Jenn Zschunke, honored those lost in the time honored tradition. The tradition of laying wreaths in Arlington National Cemetery has been around since 1992 when Morrill Worcester, owner of Worcester Wreath Company, donated a surplus of wreaths to a section of Arlington Cemetery that had been receiving fewer visitors through the years. 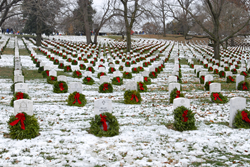 In 2005, a picture of the wreaths went viral on the internet, bringing national attention to the efforts to honor veterans. Today, the wreath laying is supported by the non-profit Wreaths Across America who were able to reach their goal of 30,000 wreaths this year, though donations were slow to start. The employees and family members they dedicated their wreaths to are listed below.